Reads Online size guide will give you an overview of sizing for women's clothing and shoes - we also have a fit guide so you can gauge the correct size of the garment you are buying. Our easy sizing chart will help you get the right fit for your body shape. Reads Online has on trend clothing from petite, regular, loose to easy fit. Should you require any further information use our Concierge Service. Reads Online sells women’s designer dresses & fashion. Reads Online is a Stockist of Verge, NYDJ - Not Your Daughters Jeans, Arche, Luxe Deluxe, Lounge The Label, Brax, Mac Jeans & many more International & Australian labels. Reads Online has a large collection of dresses, tops, ladies shirts, cardigans, jumpers, knee high boots, ankle boots, heels and sandals. Our concierge service provides unique, specialist and personal advice to our discerning customers. Catering to all size ranges from petite to curvy figure shapes our customer and styling service will make your shopping experience a delight. We have included in our size guide body measurements and length guides as well as our easy fit guide so you can get a better idea of the product you are purchasing when shopping online at Reads Online. Should you be unsure of the exact fit of a garment you wish to buy please contact our customer support service or call us om 0293278595. Measuring your bust Measure around the fullest part of your chest with your arms down by your side. Measuring your waist Measure around the natural waist line. Low Hip Measure around the fullest part of the hip. The length of a garment can be influenced by design trends as well as the style and shape of the garment. The following guide to lengths should help you determine the length for your height when you purchase one of Reads Online designer fashion garments. Hemlines may be straight, dipped, angled or assymetrical. The measurements we have quoted are taken from the shoulder to hem and are based on a 5' 6" or 165cm person. Tunic length dresses Often referred to as a mini, the tunic or mid thigh length measures approximately 86cm from the shoulder to the hemline. Above the knee length dresses Above the knee dress length may vary by 5cm depending upon your height. This measures approximately 91cm from the shoulder to the hemline and is approximately 10cm above your knee. Knee length dresses Knee length dresses may fall just above, on or below your knee depending upon your height. The length from the shoulder to hemline may vary between 96cm and 101cm. Below the knee or Mid Calf dresses Below the knee dresses tend to fall approximately10cm below the knee and may range from 107cm to 117cm from shoulder to hemline. Maxi dresses Maxi dresses may include long dresses, ballerina or ankle length dresses. The shoulder to hemline length may vary from 135cm to 148cm. 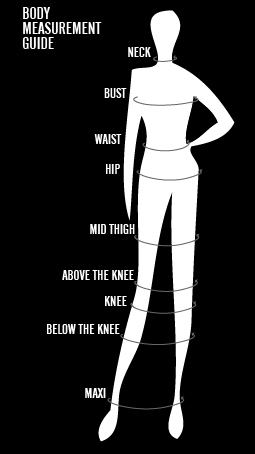 We use the following fit descriptions to describe the general fit of a garment. Slim fit Slim fit clothing refers to any garment that fits the wearer close to the body. Pants, shirts, and other garments in this style don't have extra fabric hanging or draping anywhere. People with lean body types especially appreciate the closer fit because it can give them a more tailored look. Slim fit garments are also suited for petite sizes. When purchasing a slim fit garment you may need to buy a size up from your usual size. Regular fit Regular fit clothing tends to skim most body types comfortably; regular fit pants and shirts have a little extra fabric. Any garment identified as regular fit will generally fit to standard size measurements. Regular fit garments should be bought in your usual size. Easy fit Garments identified as easy fit will be loose and you may be able to wear a size above or below your standard size. If you want an easy fit garment to fit closely buy a size down or if you want it to fit loosely buy a size up. Loose fit Loose fitting garments are generally oversized and are often a one size fits all sizing. With contemporary trends some loose fitting garments may also be sized so choose your normal size if you want to achieve the look of the design. For waist belts measure around your natural waistline. This is usually the smallest part of your torso.For hip belts measure around the fuller part of your hips where your low-rise jeans would fall. A belt is measured from the buckle prong (or other method of closure) to the middle hole of the belt.